A few years ago, I brought your attention to an online based typing curriculum called Typing Club. I didn’t realize it at the time, but I had joined a beta test group for the product and that product has finally been launched. Folks, I introduce to you the new, fully functioning Typing Club!You can read the rest of my review (of which I am not being paid to share), but there is a 10% discount if you sign your school up before July 15, 2013!! I highly recommend getting that done. I really believe that Typing Club for Schools would rock out your typing instruction for your homeschool, or for any school. Typing Club has molded their curriculum to be used in a school setting with multiple teacher and classroom options. You can sign up to register your homeschool. Once you register, you will receive an email and your assigned individual typing club account URL. That’s right, you have your own URL for your school’s typing lessons. Each child can be assigned a user name and password for their classes. If they are still young, you can sign them in yourself. I do this for my Kindergarten student. He showed interest in typing and since I am the only ‘eyes’ on his progress, I am letting him learn his home row! The fully functioning website has a very user friendly interface that opens to a dashboard with instant views of student’s attempts at their lessons. You can see that we are currently on summer break with only one student trying to brush up on their typing skills. with pre-set lessons and goals. You can adapt the lessons for your students. If a student is struggling, you can lower the typing speed or keying average required to advance to the next lesson. and determine how best to encourage them. This is what your student sees when they log in. Their class is ready for them and gives them a brief overview of their progress. 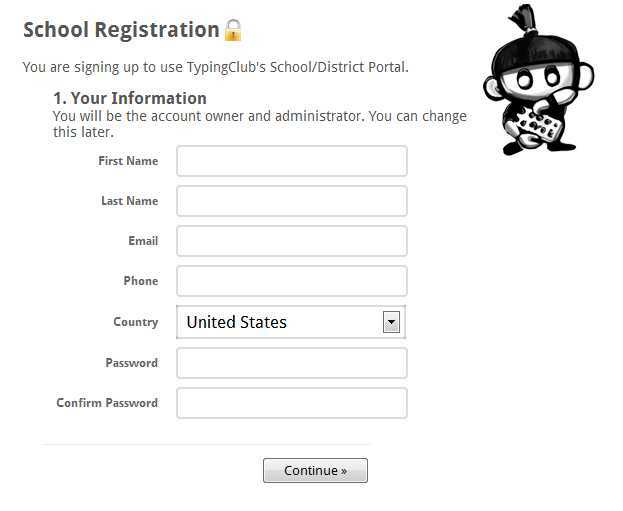 Typing Club will maintain a free version of the curriculum, but it only allows 2 teachers and 3 classes to log in. The free version would still enable your students to learn typing in a fun way! I just really enjoy and appreciate the hard work that has gone into the new Typing Club program and would highly recommend joining. I’ll have to check that out, it looks like a good typing game. Great resource! I think that we will start this week – and, hopefully, it will remain free for a while 🙂 Thanks for sharing. We have been using this for a long time. My 5 year old is getting really good at typing. Great idea to spread the word!